A worldwide criminal syndicate known as Heugsahoe exists. Their boss is Choi Hee-Gon. In 2008, the leader of the Intelligence Investigation Team of the Maritime Police, Kwon Jung-Ryool (Lee Sung-Jae), forms a secret investigation team to capture crime boss Choi Hee-Gon. Soon, Jung-Ryool gets closer and closer to capturing Choi Hee-Gon. Then, Jung-Ryool's wife Min-Jung suddenly goes missing. Her dead body is then thrown in front of Jung-Ryool. Soon after, other family members involved in the undercover operation are killed. Seon-Woo (Choi Si-Won) goes undercover on Jung-Ryool's order. Seon-Woo can't stop the mission, even though there's continuous threats on his life. Soon, a policewoman who investigates Seon-Woo is killed. It's clear the the woman's murder was committed by crime boss Choi Hee-Gon, but evidence is still lacking for his arrest. Finally, the undercover operation is abandoned. 2011 - 3 years later, Jung-Ryool appears obsessed with his job ... trying to forget the guilt he feels over the death of his wife. With the help of Hyun Hae-Jung (Jin Hee-Kyung) and a director of the maritime police, Jung-Ryool forms another special investigation team. To avoid the attention of others inside the maritime police and crime boss Choi Hee-Gon, the special investigation team is disguised as the #9 investigation team which is responsible for unsolved cases. Seon-Woo has been demoted to the country maritime police office in Gunsan City. There, Seon-Woo busts an illegal trafficking organization and runs off with their smuggled goods. Seon-Woo now becomes a fugitive. This is part of Jung-Ryool and Seon-Woo's master plan to catch Choi Hee-Gon. They hope to go through middle man Jung Deok-Soo, nicknamed Popeye. Seon-Woo approaches Popeye with his stolen goods, but Popeye finds out the truth. Seon-Woo's life is now in danger. He is saved with the help tactical team leader Kang Eun-Chul (U-Know Yunho). Seon-Woo and Kang Eun-Chul were former colleagues. Seon-Woo now joins the #9 investigation team. Seon-Woo also takes an interest in Corporal Soo-Yoon (Lee Si-Young). Meanwhile, Popeye kidnaps Kang Eun-Chul. The abduction of Kang Eun-Chul brings back memories of the slain police officer several years earlier. Actors Eric, Kim Kang-Woo, U-Know Yunho and actresses Kim Ok-Bin, Jeon Hye-Bin were originally cast for lead roles in "Poseidon." Filming began in late 2010, but stopped after 20% of the first episode was filmed. The bombardment of Yeonpyeong Island by North Korea on November 23, 2010 and bad weather caused filming to halt. The series also planned to air during the month of May on SBS, but those plans fell through. Actor Kim Kang-Woo and actress Kim Ok-Bin then announced they would resign from the series due to scheduling conflicts. Lead actor Eric then announced he would resign from the series to take the lead role in KBS2 drama "Spy MyeongWol". On June 30, 2011 production company Annex Telecom announced KBS2 would air the series. 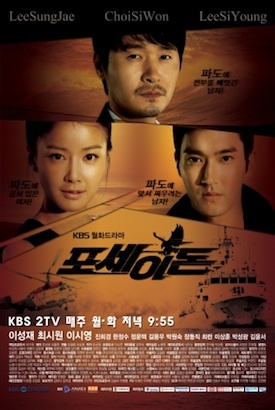 On August 1, 2011 production company Annex Telecom announced actor/singer Choi Si-Won and actress Lee Si-Young would takeover the lead roles in "Poseidon"
"Poseidon" takes over the KBS2 Mon & Tue 21:55 time slot previously occupied by "Spy MyeongWol" and will be replaced by "Brain" on November 14, 2011.
evanessa Mar 08 2017 10:10 am I love the drama,good senario,but very slowly and i want more romance...The role who play Lee Si-Young its very stupid....Still can't beat City Hunter! shin Dec 02 2015 6:03 am lee sung jae what a great actor!!!! JO Oct 19 2014 8:01 pm I love the movie, but have noticed many K-dramas leave the best songs off the OST. The hard K-pop song they SPAM at you is not on it, just a bunch of love songs. Loveseira Sep 12 2013 2:22 am Best Action drama i ever watched. . I watch this Drama THREE TIME!! AND I,M NEVER GET BORED FROM IT . Ann May 24 2013 3:15 pm I want a Part 2! Raiden Mar 16 2013 4:36 am Actually i just watched until episode 4 When Yunho had gone, i started feel bored. HearMeThroughMusic Jan 06 2013 9:07 pm Does U-Know Yunho have a lot of parts in here? kai Nov 05 2012 2:44 pm great drama! i like siwon very much...is there a part 2? hope there is... Salute to POSEIDON! great job!! Suju7 Aug 23 2012 12:32 am The show moves pretty slowly. But for some reason is still great. It has a action with a nice side story with the characters. I love Siwon but i didn't watch it for him. I watched it for lee si young haha. I just love her acting! And i think she is so pretty. Marie May 06 2012 7:36 pm I really want to see this drama... Can someone tell me If there is any romance here?? Can you tell me the story? Adel Apr 15 2012 11:12 am It's the WORST KDrama I've ever watched. The scrips, the plots, the characters, the editing, the continuity of its scenes, everything is terrible. What a waste! Dont bother to watch it, unless you're a big fans of Siwon. lea Mar 23 2012 12:36 am It's so boring and the plot is not a attractive, I just watch handsome's shiwon in this drama. Alicia Feb 25 2012 4:11 am From all korean action dramas I've watched (Iris, Athena, City Hunter, Fugitive Plan B), Poseidon was the worst. Too predictable, not much actions, too many mistakes in the filming and too much zooming in the actors faces. I'll give this drama 5/10. Frances Feb 04 2012 3:35 am I just started watching right now. The pilot is actually good. Though, my main reason why I was interested to watch this drama because I heard it's the Korean version of NCIS (It's a American Police Procedural show). But aside from that, I'm hooked with Korean Drama/Action, like City Hunter for example; so, I decided to try Poseidon. I hope I won't be disappointed. san5488 Jan 03 2012 1:55 pm could someone pls tell me who is the guy come from Japan in esp 14? yy Dec 18 2011 10:53 am why the heck that soo yoon go into that house,she should know that the house have enemies..it's really ridiculous...who the heck make that script..
yuange Oct 27 2011 2:24 am The start is rather slow but it gets more and more interesting as you see the plot more and more. The love line between Kim Sun Woo (Choi Siwon) and Officer Lee (Lee Siyoung) is also a very cute touch of romance to balance the action and drama. shaily Oct 26 2011 7:52 am don't look at the ratings. watch the drama.. its really good I like the action and everything especially Siwon. lengskee Oct 24 2011 10:45 pm Siwon acting is okay. but the pace of the series is sort of slow. hope you can make the upcoming episodes more interesting=) Good luck. SuperJuniorrrrr Oct 24 2011 12:04 pm SIWON is the best!!!!! lol Oct 21 2011 4:04 am This drama really haven't gotten me hooked. I'm on ep 5 and its been so boring, no awesome action or twists to keep me interested. Story line is pretty boring for me.. I only started watching because I thought yun ho would be one of the main. After seeing IRIS, action dramas haven't topped it yet. panda Oct 18 2011 7:39 am I really like this drama, I'm watching. I don't care about the ratings. But one thing I don't understand, why U-Know Yunho role is cameo?! idc Oct 17 2011 9:40 pm poseidon is a nice drama... never judge the drama on its first episode try to watch it as a whole so that you can appreciate the story and the actors/ actresses as they put justification on each character. i love watching this drama.. a combination of action and romance. so please everyone try to watch poseidon, promise you will enjoy watching it. buds Oct 17 2011 4:57 am YUN HO FIGHTS GOOD BUT NOT AS GOOD AS LEE MIN HO OPPA! buds Oct 17 2011 4:47 am CANT BEAT city hunter!!! Paige Joan Angelina Germanotta Oct 13 2011 9:17 am I <3 <3 <3 Choi SiWon in this drama!!! his so handsome and his acting skills IMPROVED!!! i hope more projects to come to but i also hope that you can still join the performances of the SUPER JUNIOR aside from your busy schedule!!! <3 you SiWon oppa!!!! lengskee Sep 29 2011 11:08 pm hhmmm,...why no rating? rachays Sep 29 2011 6:09 am No ratings? andwae!! Hyun Sep 27 2011 5:19 pm Nice. rebbie Sep 26 2011 7:38 am I love it! Specially all the cast..
Nope not at all. Just shares an action themed setting. street142 Aug 11 2011 10:57 pm Uknow character is only cameo. They should put Uknow as main character. Why Eric not cast on this show? This show like S.W.A.T korean version. pp Feb 20 2011 11:49 am Actually, they're not entirely wrong about Yunho's name. They probably just don't know what to use yet since it's not gonna be 'Oh Yunjae' anymore. qeyzn Dec 07 2010 1:35 am where can i find the full synopsis of this drama? info? aaah, Yunho oppa is using his real name? wow, missed him... fighting oppa!! wonder if there's an actual scene of him being in japan with japanese dialogues.. he always looked so cute when he speaks in japanese... i have no idea who the other casts are.. but i'm sensing they're really good actors..